Thermostim utilizes a combination of 3 different therapies : Electric Stimulation, Hot & Cold Therapy and Soft Tissue Massage. 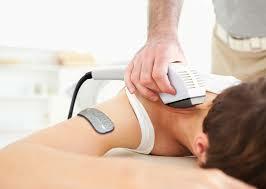 This therapy helps to break up deep muscle spasms and decrease inflammation caused by soft tissue damage. Thermostim is in an all in one tool that has the ability to perform 3 effective treatments all at the same time. Patients receive the benefit of not only 3 therapies in one but, it cuts treatment time by 1/3. Don't just live with or mask your pain! Get a second opinion today and be on the road to better health. At SpinalCare Physical Medicine, we offer free consultations for a case analysis and MRI review. Call or click the button below to request your free consultation and MRI review. Download a free eBook about Neuropathy or Back Pain and the treatment options available in our office. Your Guide to Back Pain Relief | Neuropathy Relief: Enjoy Life Again - Without Drugs!